Roma Children, originally uploaded by bill kralovec. 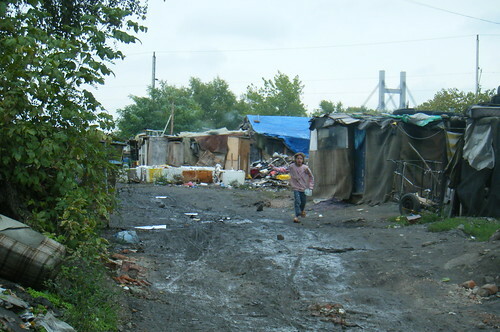 Monday a delegation from our school visited the Roma Settlement in Rakovica, a suburb of Belgrade. 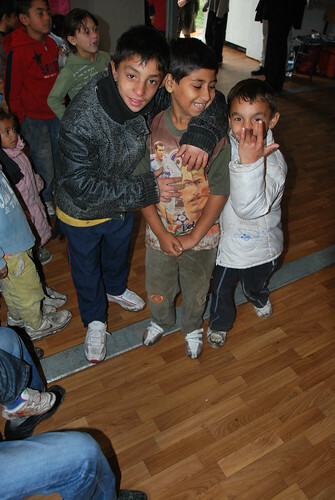 The purpose of the visit was to deliver clothes and to entertain the children of the settlement. The High School Choir sang and we brought a truck load of clothes that were donated by the school community. This settlement is one of several places that the Roma people that lived under the Gazelle Bridge were moved to. Earlier this fall, the large, Gazelle Bridge, makeshift village was plowed under by city officials. With the help of the United Nations and other organizations, new settlements were found for the approximately 20,000 people living there. I spoke with a government social worker who helps the families in the settlment we visited. She said that the municipality of Rakovica donated the land. Rakovica is a suburb of Belgrade located on the south side of Kostunjak Park. It is a heavy industrial area and we noticed many factories near the site. There was also what appeared an older Roma settlement on the hill above the site. Trailers donated for 37 families. 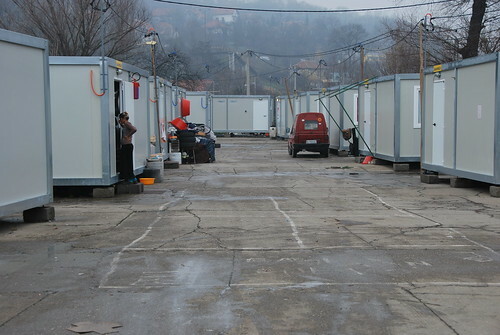 Each trailer has electricity, plumbing, and running water. All utilities are free. The Bread of Life, a non-governmental organization provides one hot meal a day for the community. The site is near one of the regular city bus routes into the city where children go to school and adults can go to work. The trailers are well kept by the families. The Roma people have been an endless source of fascination for me and the family. Most are very poor and we see them often picking through the garbage for cardboard, plastic, etc. I spoke with several Roma community members and they are quite happy with trailers and the new living conditions. Much improved from the slum they were living at, although they are a bit further out of the city. One of the community leaders was concerned about the values of the children and wanted the school to help with giving the message to the Roma children the importance of education. From what I have read about Roma, and from talking with the social worker, part of this is cultural. Roma have a difficult time adapting to Western cultural values of employment, delayed gratification, and long-term thinking. They were all very friendly and welcoming to us. It was great for our students to see the other side of life. We have an affluent community, and it is important to develop in our students, a community conciousness. I am a firm believer in a judgement of a society is how it treats its lowest members. The Roma need to be taken care of and supported so future generations can integrate into modern society and contribute to the good of Belgrade and Serbia. The generosity of our community was outstanding. A huge amount of clothes were donated. So much so, that some will be delivered to various places needing it. We also work with an orphanage near the school and we’ll be visiting them next week. The choir sang in a large trailer that serves as a community center (photo above). The Roma children enjoyed the music and it brightened up the day for the mothers and children. I noticed a lot of people hanging around on a Monday, especially men, and that may indicate that many are not working or have steady jobs. I hope that our school and me personally can do more for the Roma and the poor and needy of Belgrade.